The Yale Program on Climate Change Communication is out with a remarkable series of maps summarizing Americans’ opinions on climate change. 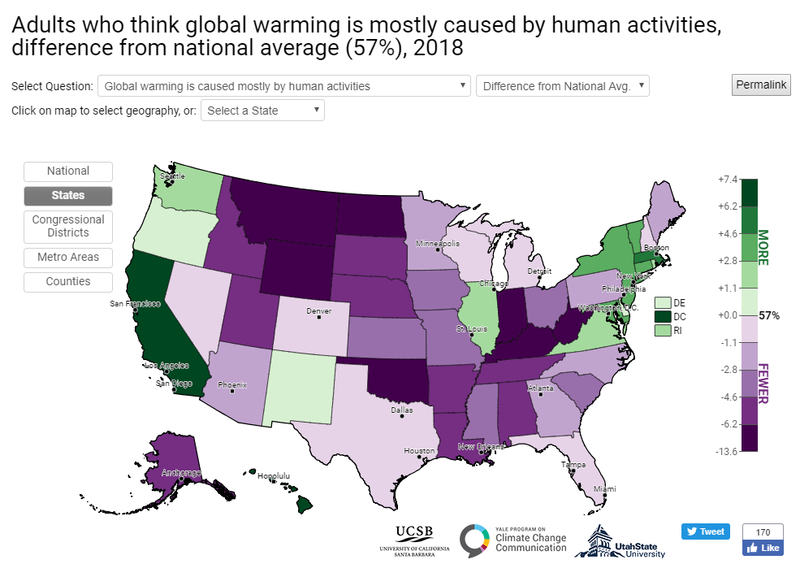 By county, metro area, state, congressional district or the U.S. as a whole, the Yale Climate Opinion Maps present views on a broad spectrum of climate questions and issues. The map above is just one of several hundred that may be viewed and downloaded from the Yale web site. Note that the link in the prior paragraphs goes to a different map than the one at right. The interactive menu lets you move among more than two dozen survey questions collated at five different geographical levels and showing either absolute percentages or deviations from the national norm. We’re still digesting the survey methodology and findings. Come back to this page soon for more commentary, but be sure to go to the Yale site and take your own tour. Graphic from NORC-AP poll released 6-16-2017 (annotation by CTC). The widely respected National Opinion Research Center – Associated Press polling collaborative issued its latest poll results late Friday, June 16. While the NORC-AP press release led with Pres. Trump’s abysmal (64%) disapproval rating, a potentially more significant result was the one highlighted in the graph at left. If this result indicates genuine public sentiment, it could translate into repudiation of climate-denying and climate-ignoring candidates in the 2018 Congressional primaries and elections. It may also portend and provoke more members of Congress to endorse the Citizens’ Climate Lobby’s Republican Climate Resolution or take similar steps diverging from G.O.P. anti-climate orthodoxy. The full NORC-AP poll may be downloaded here. Go to p. 4 for a breakout of the climate change responses. 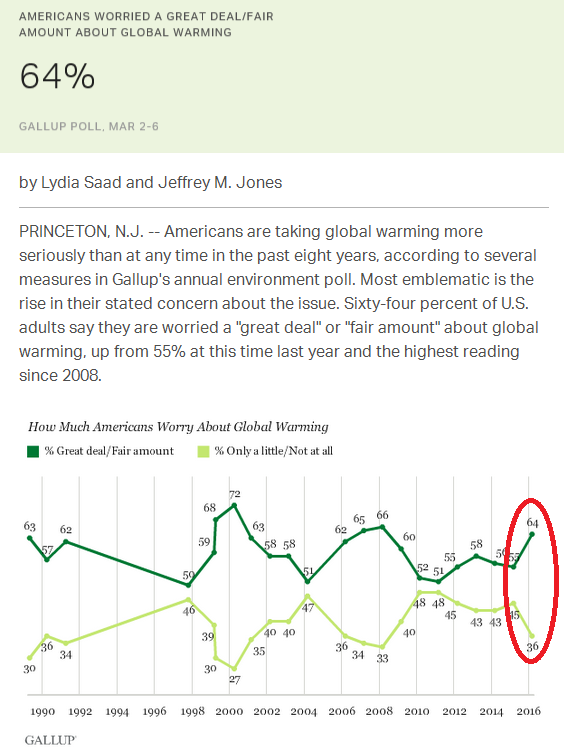 “Global Warming Concern at Three-Decade High in US,” the Gallup Organization pronounced in a March 2017 news release. “Americans are increasingly warming to the idea of a carbon tax,” reported the National Survey on Energy and Environment (NSEE) from the University of Michigan and Muhlenberg College, one day later. Support for carbon taxes registered 14 points higher than in prior surveys, with strong support now at 25%, more than double its prior high. 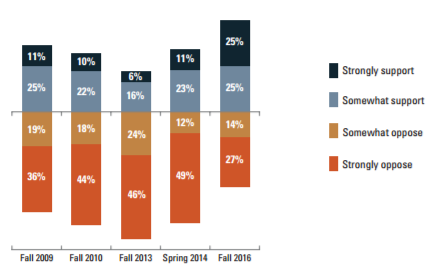 Source: NEES poll, Fall 2016 (see text). The findings from NSEE are especially significant. First, their poll, from Fall 2016, just before the elections, concerned carbon taxing specifically rather than climate change generally. Second, this was their fifth survey with that question, going back to 2009, allowing comparisons over time. The graph at left makes the rising support crystal clear. The survey [found that] support for a carbon tax has substantially increased across the political spectrum from when the question was last asked in Spring 2014. Support this fall was 66% among Democrats (a 29 percentage point increase from Spring 2014), 30% among Republicans (a 15 percentage point increase), and 47% among Independents (a 9 percentage point increase). The NSEE opinion researchers also found that support for a revenue-neutral carbon tax exceeded that for a generic carbon tax for which revenue use was unspecified. While this may not reflect a preference for revenue-neutrality as much as revenue salience (since the question may have tipped off the interviewees that revenues are part of the carbon tax equation), it suggests that proponents of revenue-neutral approaches such as Citizens Climate Lobby and the Climate Leadership Council have their fingers closer to the public pulse than do economists who prefer tax swaps as the means to a revenue-neutral carbon tax. 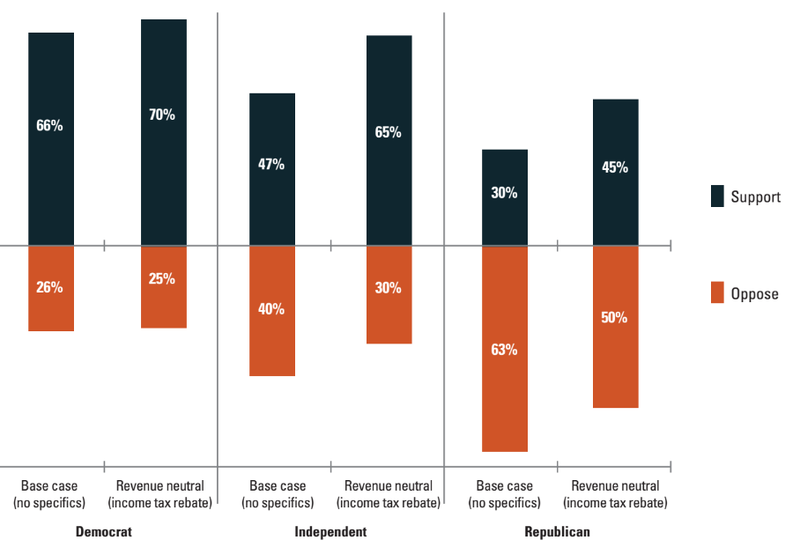 Support for a revenue-neutral carbon tax (with revenues returned as income-tax cuts) exceeds that for a carbon tax with no revenue use details, especially among independents and Republicans. Source: NSEE poll (see text). Even newer is the poll conducted in March 2017, by Gallup, with results shown at right. 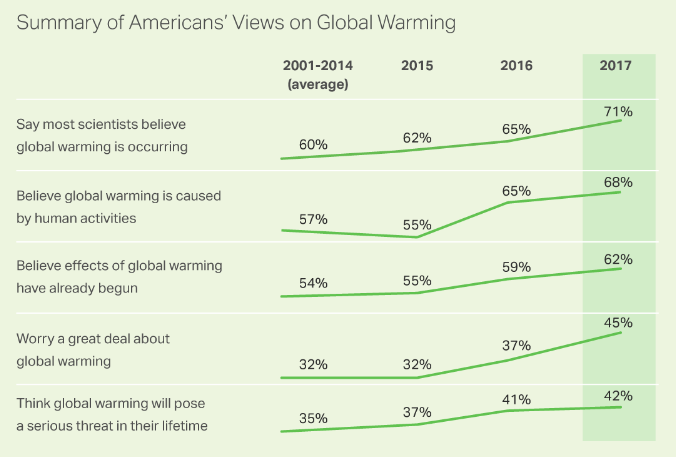 Most significant, perhaps is the rise to 45% in the number of respondents who “worry a great deal about global warming.” The 45% figure is up from 37% a year ago and well above the recent low point of 25% in 2011. Worry — anxiety, fear, upset — is more easily translated into political preference and action than is mere belief. According to Gallup, the 45% figure for “worry a great deal” about global warming is the highest ever, besting the previous top figure of 41%, recorded in 2007 — a couple of years before the hydra-headed Koch Brothers-funded front groups unleashed their “the science isn’t settled” assault on the broad scientific consensus that climate change is real, human-caused and dangerous. The lost decade will haunt humanity and Earth’s other living beings for centuries, perhaps forever; but it appears that American public opinion may have climbed back from the denialist-made abyss. 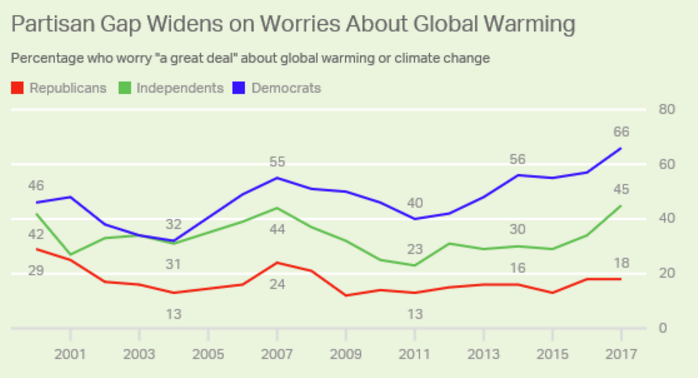 Unfortunately, this rebound in polling has not occurred across the political spectrum, according to a companion post from Gallup, Democrats Drive Rise in Concern About Global Warming. Actually, that headline appears to be misdirected; as the Gallup graphic at left shows, the striking rise in concern (as measured in responses to the worry a great deal” question) is most evident in independents, who registered 45% on that score in March, up from 30% several years ago. Democrats who say they worry a great deal also increased, to 66% from 56%, but Republicans hardly budged, polling at just 18%, barely up from 16% a few years back. Three polls from early 2015 and much of 2016 heralded the very strong poll findings reported above. In 2015 we called this the most carbon-tax-positive datapoint yet. The results, released in April 2015 (pdf), showed that two-thirds of Americans support making corporations pay a price for carbon pollution, provided the revenues are redistributed, i.e., made revenue-neutral. At the time, we called the finding the most powerful indication yet that the public is warming to carbon taxation as the premier policy for combating climate change. Full Yale poll here, Yale summary here, CNBC article here (“Nearly half of Republicans favor this kind of carbon tax, contrary to GOP platform”). A related publication, Climate Change in the American Mind, contains revealing details on the evolution of climate concern (but not on carbon taxes or other possible policy responses) among Americans since 2008. Other results from the 2016 Gallup poll were equally striking. They showed a record-high share of Americans stating that climate change poses a threat to them and their way of life; a record number agreeing that climate change is caused primarily by human activity; and climate concern climbing across the political spectrum: on the left, center and right. Two-thirds of Americans accept that global warming is occurring, including 56% of Republicans. (Acceptance of Global Warming Among Americans Reaches Highest Level Since 2008, National Surveys on Energy and Environment, University of Michigan 2015.) Acceptance of global warming has varied between about 52% (2010) and 72% (2008) over the last decade. Polling the American Public on Climate Change (April 2013), by the Environmental & Energy Study Institute offers comprehensive data on U.S. public opinion on climate change. It deftly graphs the ups-and-downs of public opinion since 2006 as registered in half-a-dozen leading surveys, and summarizes (with links) 20 different climate polls from 2012 and 2013 — all in just four pages. 83% of Americans say the U.S. should make an effort to reduce global warming, even if it has economic costs. 65% say that corporations and industry, 61% say that citizens themselves, and 52% say the U.S. Congress should be doing more to address global warming. 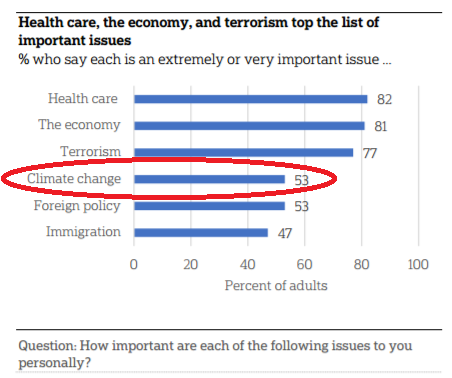 71% say global warming should be a “very high”, “high”, or “medium” priority for the president and Congress. 67% of Democrats and 52% of Republicans support eliminating all subsidies for the fossil-fuel industry. National Survey of American Public Opinion on Climate Change (Brookings, April 2011) polled and compared the perceptions and preferences of 916 residents of the United States with those of 1214 Canadians. Brookings found that 56% of Americans supported national cap-and-trade while 46% supported higher fossil fuel taxes. In Canada, the figures were 63% for cap-and-trade and 58% for fossil fuel taxes, respectively. Hart – U.S. Climate Task Force (December 2009) survey of 1,002 adults found that of those who supported action to address global warming, 58% supported a tax on carbon emissions that created incentives to reduce emissions and increase efficiency and provided tax refunds to individuals and households to offset the overall impact of the carbon tax. This compared to 27% who preferred a cap-and-trade option setting an overall limit on emissions, allowing companies to buy and sell permits. The difference between the Hart results and those of the Brookings and Yale surveys may be explained in part by the more detailed explanations of the policies offered in the Hart poll. 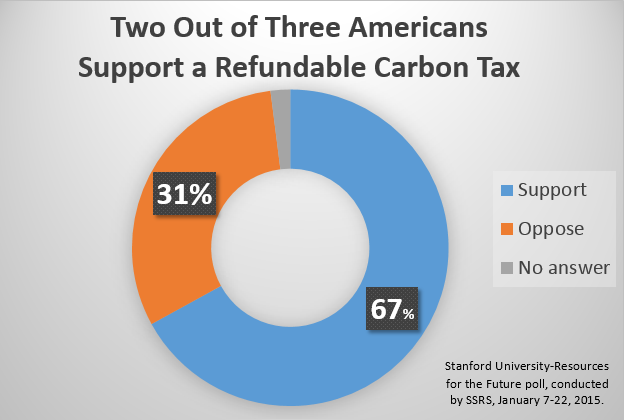 This suggests that clear articulation of the benefits of a carbon tax (and the options for revenue return) could result in majority support, at least among those willing to support action to mitigate global warming.